Whoopie Pies have seen a bit of a resurgence in recent years. This might be due to the popularity of cupcakes, since Whoopie Pies are really a cupcake in sandwich cookie form. 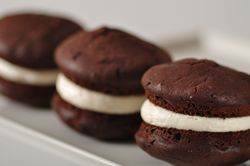 They come in many flavors, but the classic seems to be these Chocolate Whoopie Pies which combine two soft and moist, dome shaped chocolate cookies with a creamy vanilla flavored filling. What's nice is that they can be stored for up to a week in the refrigerator and you can enjoy them cold or at room temperature. Just in case you haven't read the head note for the Pumpkin Whoopie Pies, I will tell you a little about the Whoopie Pie's history. The debate is ongoing, but they have their origins in either the Amish country of Pennsylvania or in New England. Nancy Baggett in her book "The All-American Cookie Book" gives an excellent account of their history. She tells us that they can be traced back to the depression era and the Berwick Cake Company of Boston was the first to start making them commercially (around 1926). Although we may never know who or how someone came up with these delicious cookies, the story is that one day a creative cook had leftover cake batter and decided to make large round cookies with it. When they turned out, the cook was heard to say "Whoopie!" "Pies.". If you are wondering why they are called "Pies", it is because cakes were once baked in pie tins, so the two names often became interchangeable. For Chocolate Cookies: Preheat oven to 375 degrees F (190 degrees C) and place oven rack in the center of the oven. Line two baking sheets with parchment paper. Bake for about 9 - 10 minutes or until the tops of the cookies, when lightly pressed, spring back. Remove from oven and transfer to a wire rack to cool completely. Filling: Beat the shortening and butter until soft and creamy. With the mixer on its lowest speed, gradually beat in the confectioners' sugar. Increase the speed to high, and beat until light and fluffy, about 3-5 minutes. Then, with the mixer on low speed, beat in the vanilla extract and slowly drizzle in the corn syrup. Continue to beat until the filling looks like soft mayonnaise.